Get you discount by 1 of 3 methods. Show Schuh your Student Card over your webcam, Email them a scan or photo of your Student Card or register with UNiDAYS. Where do I use my Schuh voucher code? Choose a Schuh code and click ‘Get code’. Copy the code provided and follow the link to the Schuh website. When you’ve found the perfect pair of shoe, add them to the basket as normal. Go to the basket and click the text ‘student discount / promo code’ which will reveal a box for you to enter your code. Your savings will be automatically applied to your order total. Go to ‘Secure Checkout’ to finalise your order details. "If you’re a student you can get a 10% discount. All you need is a valid NUS card." "You can get free standard delivery at Schuh by spending £20 or more. Your purchases will be delivered for free within 2 to 3 days." 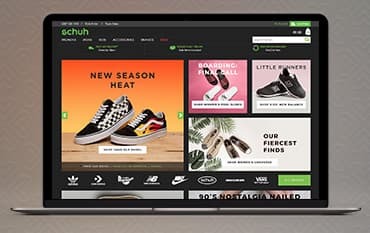 Schuh offers free standard UK delivery to homes as well as free Reserve & Collect service at over 70 stores nationwide, and there’s a 365-day return policy on the slim chance you’re not completely happy with your new footwear. Schuch know that kids shoes are a big priority, those growing feet need only the best of the best. Check out Schuch’s great range of shoes for boys, girls, and toddlers; for the tiny tots, there’s even cute baby shoes. With everything from kids’ trainers to school shoes, Schuh provides long lasting, durable shoes from brands such as Converse, Nike, and Adidas; you’re sure to find their perfect fit. Order before 10pm for Next Day UK Delivery. Not many people go through life without owning a pair of the legendary basketball shoes, and you certainly shouldn’t be without a pair either. Converse All Stars have been flying the popularity flag for a long time; from the classic All Star Oxford to the newly launched Chuck Taylor II. Check out Schuh's vast collection of Women’s, Men’s and Kids ranges and find different styles and fits to suit the whole family. Schuh offer a refund or exchange on unused items returned within 365 days. How can I find a Schuh store near me? To find a Schuh store near you please use the store finder. If you’re shopping for great deals on branded footwear, take a look at our Schuh discount codes for excellent prices on top names like Converse, Vans, DC, Toms and Nike. Use one of our Schuh Discount Codes for the biggest savings and hottest discounts on your hard-earned cash. With a huge selection of trainers, flats, heels, boots and bags for men, women and kids alike, as well as a wide variety of shoe care products, you’ll find everything you could need at very competitive prices. We are constantly on the hunt for first order Discount Codes for Schuh to help you with your money saving. Our experts check dozens of sites for secret codes including NHS discounts, student sites & social media channels saving you time & money!